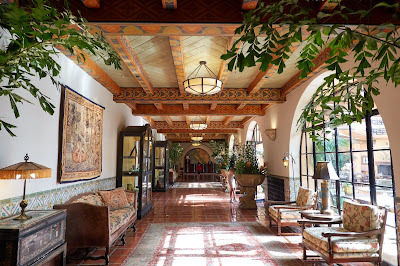 Where to stay in Santa Barbara? A beautiful destination on southern California's Pacific coast, Santa Barbara is an easy drive up the coast from LA. 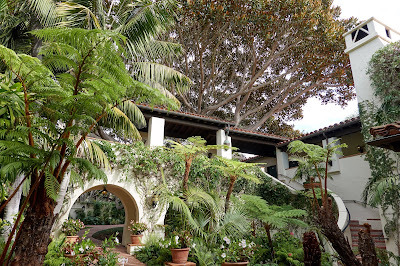 Worth more than one visit, Santa Barbara offers two distinct vacation experiences. You might spend the weekend at an elegant/casual resort high in the hills, with sweeping sunset views of the Pacific Ocean and easy access to the historic sites of Santa Barbara. Or you can enjoy a tropical resort right by the beach. (1) The lobby is gorgeous. When previously visiting the Santa Barbara County Courthouse, I was most impressed by the tile floors and elaborately painted ceiling beams of this classic landmark. The Courthouse provided the inspiration for the recent redesign of Four Seasons' lobby. It's simply beautiful. We enjoyed lunch on the patio at Bella Vista, just off the lobby, and enjoyed the ocean vista from our table. (2) The grounds remind me of Hualalai. Topical greenery lines walkways throughout the resort. While I knew I was in Southern California, it felt like Hawaii. The buildings, of course, were Spanish Colonial in style, not Hawaiian. 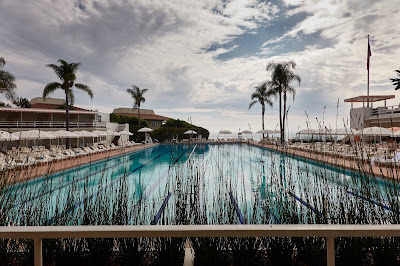 Four Seasons has its own resort pool just for guests, as well as the Coral Casino Beach and Cabana Club with its larger-than-Olympic size pool. One of the unadvertised perks of booking through a Four Seasons Preferred Partner travel advisor: guests in all room categories enjoy access to the Coral Casino Beach and Cabana Club. (3) For something special, book a Bungalow. 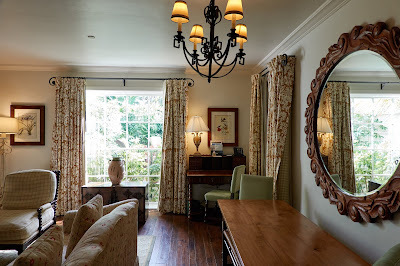 Jungle Rooms are certainly comfortable and attractive with 450-550 square feet of living space; I recommend requesting a ground floor room in order to enjoy a large outdoor patio with direct access to the lawn. But Four Seasons' Bungalows and specialty suites are truly unique — they feel like an elegant beach home. The living room of the bungalow we saw is pictured above — and this bungalow even has its own private pool. As Four Seasons Preferred Partner travel advisors, we offer exclusive amenities that will save you hundreds of dollars during your stay. Each of our clients (even those booked in Garden or Riviera rooms) has complimentary access to the Beach Club. If you're looking for perks such as — actually I'm not permitted to list those on a public webpage, but they're even better than Virtuoso or Amex Platinum amenities — you'll get those benefits through Ourisman Travel. Just email us for the full details!